I remember the day in 1995 when the discovery of the top quark was announced at Fermilab. There were reporters. There was champagne. There was a raucous party. It was a big deal, the likes of which are seen once every decade or two. The reason the top quark was so hard to find at Fermilab was that its mass is so big; it was hard to make with the Tevatron of the early 1990s. At the Large Hadron Collider, which came online in 2008, things are different. The LHC has higher energy — high enough that making top quarks is now relatively common. In CMS, top quarks are produced at a rate of about one per second. Quantum chromodynamics, which scientists have been studying since the 1970s, is the theory of the strong force, and it governs the behavior of quarks and gluons. Scientists would like to know whether this well-studied QCD theory correctly predicts what is seen in top quark production, just as it does for other, lighter quarks. QCD predicts that, in addition to the “main event” in which a top quark-antiquark pair is made, other quarks and gluons are also produced. It’s kind of like when you slap your hand hard down into water. There’s all the main activity where your hand hits the surface, but there are also stray drops of water that fly around. QCD should be able to predict on average how many extra “drops” of quarks and gluons are produced. This measurement goes beyond simply testing QCD. 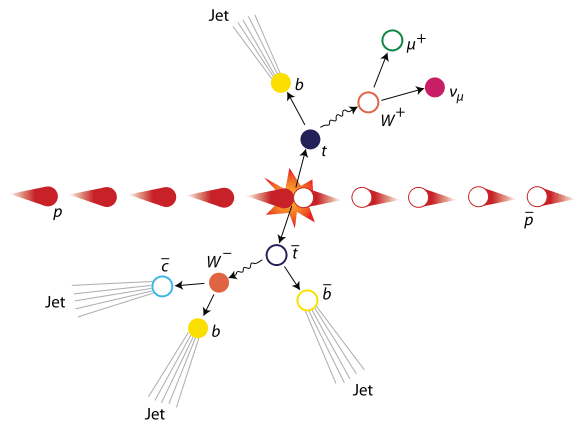 Many new physics theories predict that events in which top quarks are produced might be a good place to look for, for instance, events with Higgs bosons or that reveal supersymmetry. CMS scientists took a couple of data samples containing more than 100,000 top quarks and quantified the presence or absence of other quarks and gluons. The data was in very good agreement with the predictions of QCD, which means there was no big discovery. Nevertheless, the data verified that QCD is a good theory of top quark production, so we can be that much more confident about any future discoveries that hinge on the presence of top quarks. It is often said in particle physics that yesterday’s discovery is today’s calibration point and tomorrow’s annoying background. For those of us who were part of the top quark discovery, we can but shake our heads. It’s hard to imagine that the top quark has so quickly become yet another tool to explore our universe. And yet it has. That’s a good thing. ← What Do You Know About The Giant Magellan Telescope?